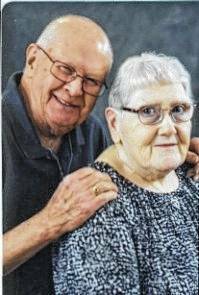 John and Barbara (Crabtree) Elliott of Woodstock celebrated their 60th anniversary Aug. 17. They were married on that date in 1957 by the Rev. R.E. Koch at his residence in Fountain Park. They are the parents of two sons, Gary (Paula) Elliott and Roger (Penny) Elliott, both of Mechanicsburg. They have four grandchildren. Mr. Elliott retired from Navistar, Springfield, and Mrs. Elliott is a homemaker.